Picking back up where I left off - I'm grateful for a charming place to experience a wonderful meal. 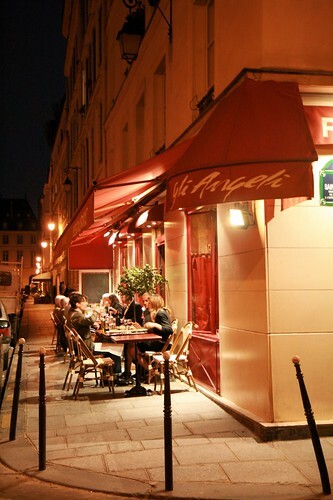 David Zobel, the brilliant pianist and dear friend introduced me to this place last year, and it has since become a favorite "evening out" place in Paris. Nothing fancy, but just great food. Of course, it's Paris - so I could take a photo of most any place and call it great, but what's nice about spending time in a city is finding the places you like to return to, which go far in making it feel a bit more like home. Ahhh another photo that I just want to jump into! Hope to see you together someday!